The South Fork of the Salmon is a major tributary to the beloved Wild and Scenic Salmon River— the second longest free-flowing river in the lower 48 states. The South Fork provides habitat for threatened and endangered fish and some of the state’s best expert-level whitewater. A Canadian mining company’s proposal for multiple open pit gold and antimony mines in the river’s headwaters threatens to pollute this Idaho treasure and all of the downstream communities that rely on it for jobs, economic livelihood and cultural heritage. The U.S. Forest Service must protect the South Fork of the Salmon, the Wild and Scenic Salmon River, and endangered fish by denying this mining proposal. 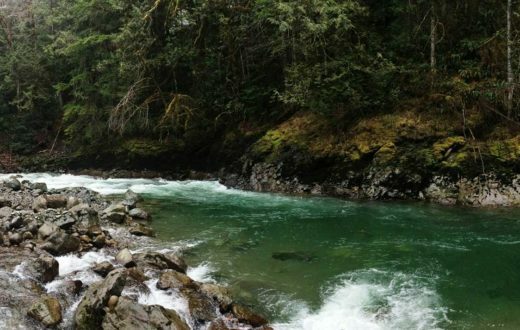 Take action: Ask the U.S. Forest Service to protect the health of, and investment in, the South Fork of the Salmon River, the water quality of the Wild and Scenic Salmon River, and the long-term recovery of endangered fish by prohibiting the reopening and expansion of the Stibnite Mine. The South Fork of the Salmon River’s headwaters are high in the Salmon River Mountains east of Cascade, Idaho, at almost 8,000 feet. The river travels for approximately 86 miles north to where it meets the Salmon River at Mackay Bar. 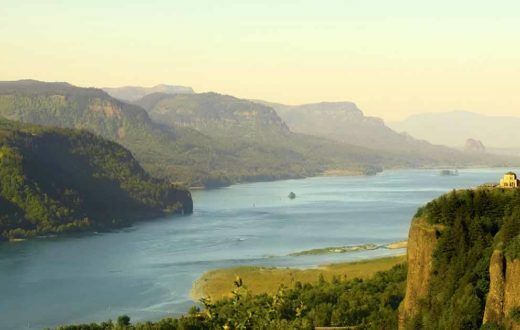 The Shoshone, Nez Perce, Bannock and Paiute tribes have used the river for fishing and hunting for generations. The South Fork of the Salmon River is designated as critical habitat for endangered chinook salmon and steelhead and threatened bull trout. It is also home to westslope cutthroat trout, another sensitive species. The South Fork Salmon watershed is one of the linchpins in the ongoing work to restore endangered salmon and steelhead to Idaho. The river has been found eligible and suitable by the U.S. Forest Service for federal Wild and Scenic protection. Extensive logging and road building, as well as heavy metal contamination from mining have taken their toll on river health over the years, but the South Fork Salmon is on the mend, and still boasts clear, free-flowing waters. 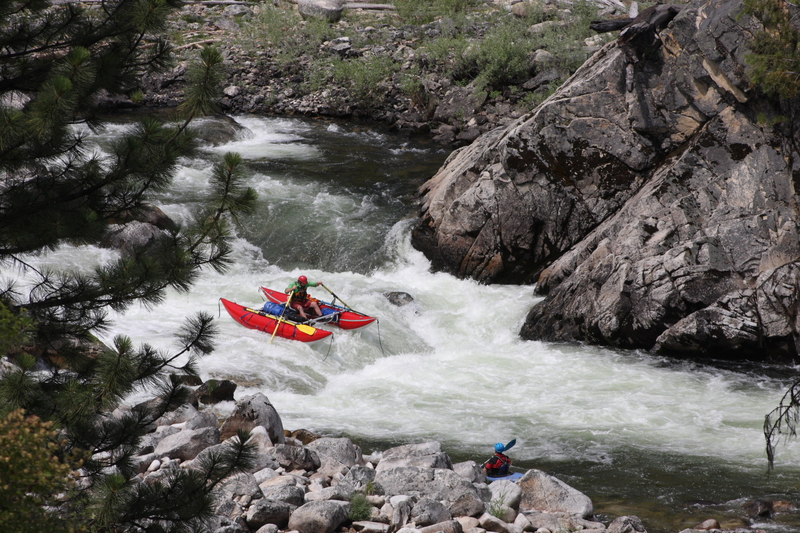 The river is a magnet for expert whitewater paddlers from around the world. Multiple hot springs offer opportunities for multi-season camping and gathering. 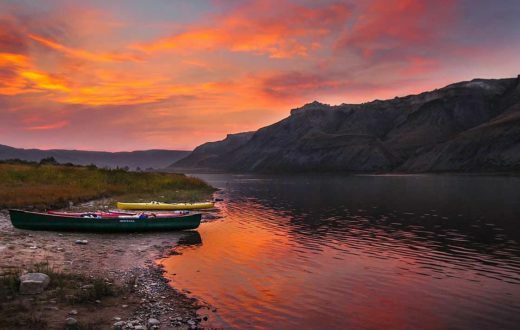 The river feeds the Wild and Scenic Salmon River and supports a thriving recreation economy, attracting tens of thousands of people annually to the area for boating, fishing, hiking and other activities in the towns of Riggins and McCall. The demand for Idaho’s precious gems and heavy metals continues to threaten the state’s public lands and rivers. Pollution and scars from past mining remain across the landscape of Idaho’s public lands and rivers. At the headwaters of the South Fork Salmon River is an old open-pit mine site called Stibnite. For several decades, the mine sat dormant while state and federal agencies worked to reclaim the site. However, Midas Gold wants to reopen two massive open pits in a former mining site and open a third new pit for mining gold and antimony. Mining began at Stibnite in the late 1800s. Since that time, levels of arsenic, mercury and antimony in the surrounding creeks and rivers have been high. However, according to a recent meta-analysis, detected heavy metals are on the decline. In addition, $13 million has been spent in restoration and reclamation at Stibnite to cap legacy tailings and waste rock piles. Now, decades later, Midas Gold has submitted plans to the U.S. Forest Service to reopen and expand the mining operation. Midas Gold has channeled considerable resources into a public relations campaign, stating its interest in fixing the Stibnite area’s legacy mining impacts. However, Midas Gold’s Plan of Restoration focuses on expanding the two extant pits and creating a third new pit. A tributary to the South Fork of the Salmon River already flows through one of the open pits and contributes to water contamination in the South Fork of the Salmon River. Expansion of the mine will exacerbate and accelerate the problem. This project would unearth more arsenic, mercury and antimony that, through natural processes, such as acid mine drainage, and potential accidents and spills, would deposit directly or indirectly into the South Fork of the Salmon River, jeopardizing the protected Main Salmon River and endangered fish downstream. 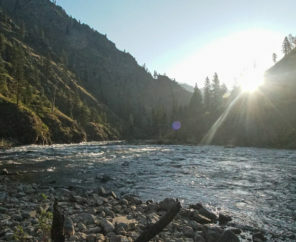 Regardless of intentions, mining operations are inherently toxic for river health, water quality and the environment, and the scale at which this project is proposed would have catastrophic repercussions for the South Fork of the Salmon River and the downstream communities that depend on a healthy Salmon River system. Toxic polluted water will directly affect the fisheries, recreation economy, cultural importance and healing process for South Fork waters. In July 2017, the Payette National Forest completed a public scoping comment period, as required by the National Environmental Policy Act (NEPA). The U.S. Forest Service received thousands of comments in opposition to the mine, from people who said they would be directly and negatively impacted by its operations, including business owners, campers, hunters, anglers, rafters, kayakers and others. Since that time, a major coalition of local residents and South Fork enthusiasts has been coalescing to fight the mine. Due to the power of the Mining Law of 1872, stopping the development of this mine will take significant and focused efforts from concerned citizens. In August 2018, the Payette National Forest will release a Draft Environmental Impact Statement (DEIS) on Midas Gold’s proposed project, followed by a public comment period. The U.S. Forest Service must protect the health of, and investment in, the South Fork of the Salmon River, the water quality of the Wild and Scenic Salmon River, and the long-term recovery of endangered fish by prohibiting the reopening and expansion of the Stibnite Mine. Find out about our work in the Pacific Northwest.